Corsages. Les modes du second empire 1852 a 1870. 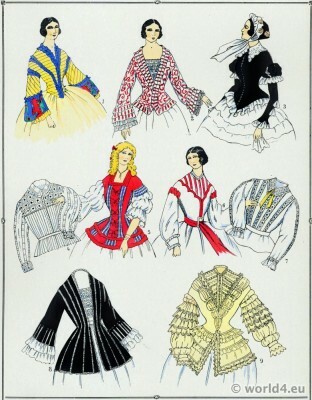 Bodices. The modes of the second empire. 1852 to 1870. L’histoire du costume féminin français. Les modes du second empire 1852 a 1870. Corsages – Planche 6. This entry was posted in 1852, 1870, 19th Century, France, French fashion history, Second Empire, Victorian period and tagged Bodice, Paul Louis de Giafferri, Second Empire Style, Second Rococo period, Victorian fashion on 4/26/14 by world4. Coiffes, Capuchons. Les modes du second empire 1852 a 1870. Caps and Hoods. Coiffes, Capuchons. Caps and Hoods. The modes of the second empire. 1852 to 1870. 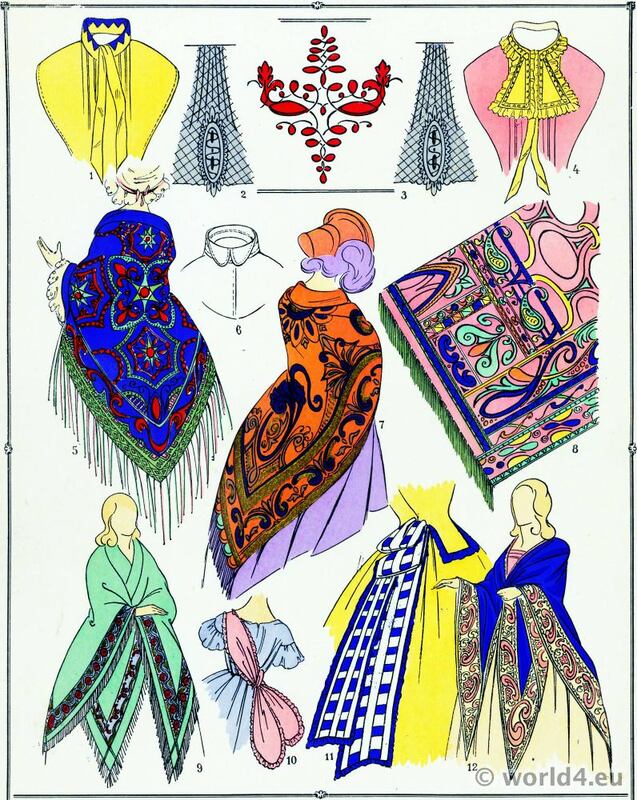 L’histoire du costume féminin français. Les modes du second empire 1852 a 1870. Coiffes, Capuchons – Planche 4. 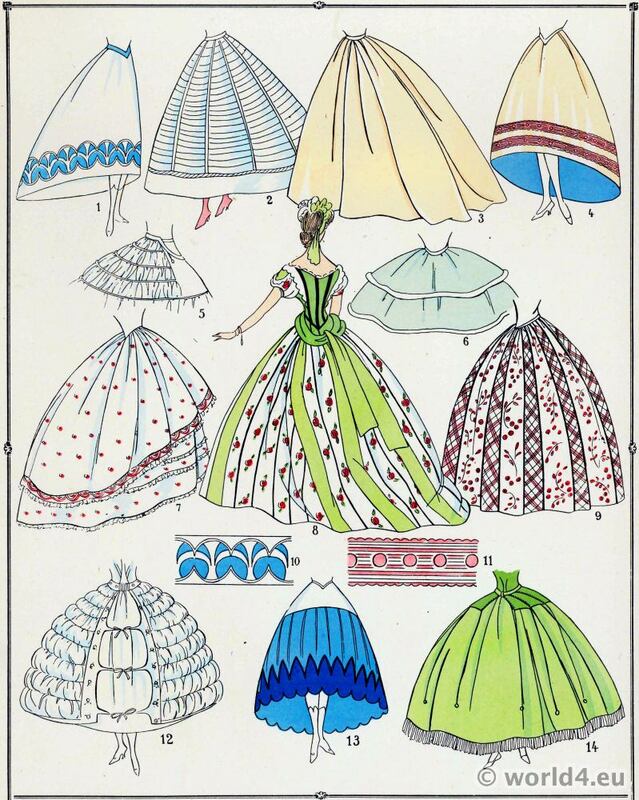 This entry was posted in 1852, 1870, 19th Century, France, French fashion history, Second Empire, Victorian period and tagged Bonnet, Crinoline costumes, Paul Louis de Giafferri, Second Empire Style, Second Rococo period, Victorian fashion on 4/26/14 by world4. Manteaux. Les modes du second empire 1852 a 1870. Coats fashion. The modes of the second empire. 1852 to 1870. L’histoire du costume féminin français. Les modes du second empire 1852 a 1870. Manteaux – Planche 3. 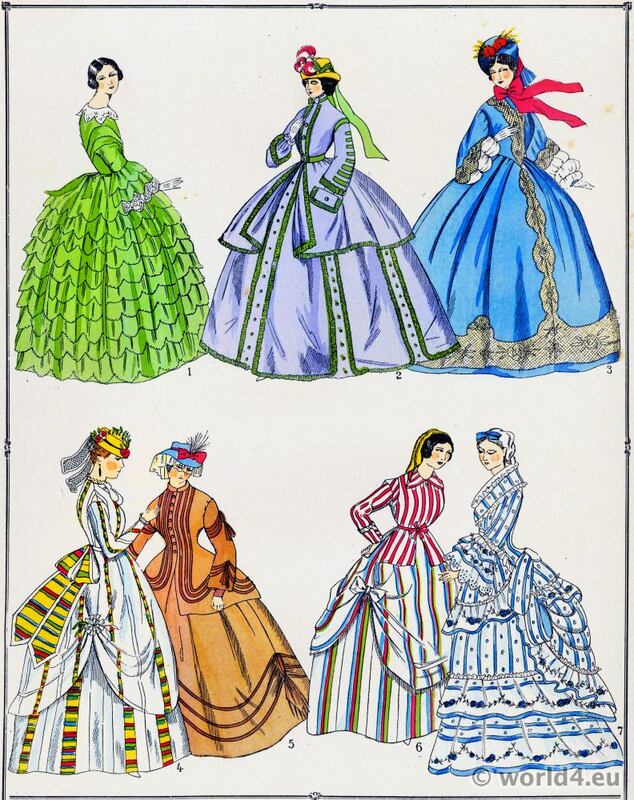 This entry was posted in 1852, 1870, 19th Century, France, French fashion history, Second Empire, Victorian period and tagged Crinoline costumes, Paul Louis de Giafferri, Second Empire Style, Victorian fashion on 4/26/14 by world4. Jupes. Les modes du second empire 1852 a 1870. Skirts. The modes of the second empire. 1852 to 1870. L’histoire du costume féminin français. Les modes du second empire 1852 a 1870. Jupes – Planche 7. This entry was posted in 1852, 1870, 19th Century, France, French fashion history, Second Empire, Victorian period and tagged Paul Louis de Giafferri, Second Empire Style, Second Rococo period, Skirt fashion on 4/26/14 by world4. Manches. Les modes du second empire 1852 a 1870. Sleeves. The modes of the second empire. 1852 to 1870. 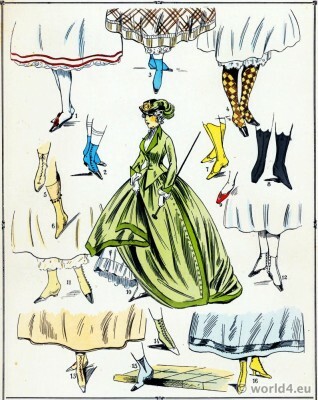 L’histoire du costume féminin français. Les modes du second empire 1852 a 1870. Manches – Planche 8. This entry was posted in 1852, 1870, 19th Century, France, French fashion history, Second Empire, Victorian period and tagged Paul Louis de Giafferri, Second Empire Style, Second Rococo period, Victorian fashion on 4/26/14 by world4. 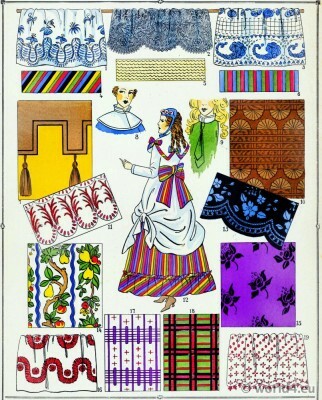 Broderies. Dentelles. Les modes du second empire 1852 a 1870. Embroidery. The modes of the second empire. 1852 to 1870. L’histoire du costume féminin français. Les modes du second empire 1852 a 1870. Broderies, Dentelles – Planche 8. This entry was posted in 1852, 1870, 19th Century, Embroidery, France, French fashion history, Second Empire, Victorian period and tagged Paul Louis de Giafferri, Second Empire Style, Second Rococo period, Victorian fashion on 4/26/14 by world4. Étoffes. Les modes du second empire 1852 a 1870. Fabrics. The modes of the second empire. 1852 to 1870. 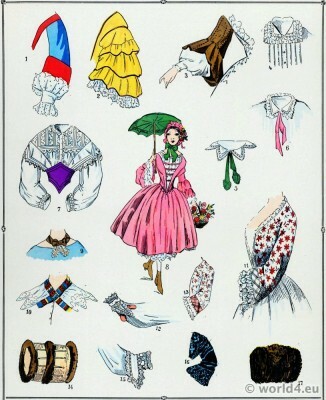 L’histoire du costume féminin français. Les modes du second empire 1852 a 1870. Étoffes – Planche 10. This entry was posted in 1852, 1870, 19th Century, Fabric, France, French fashion history, Second Empire, Victorian period and tagged Paul Louis de Giafferri, Second Empire Style, Second Rococo period, Textile design, Victorian fashion on 4/26/14 by world4. Chaussures. Les modes du second empire 1852 a 1870. Shoes. The modes of the second empire. 1852 to 1870. 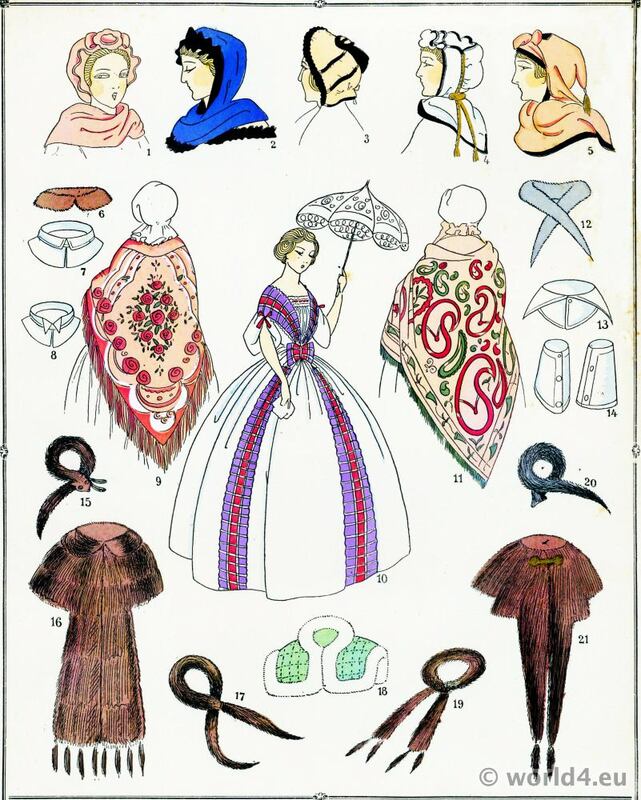 L’histoire du costume féminin français. Les modes du second empire 1852 a 1870. Chaussures – Planche 11. 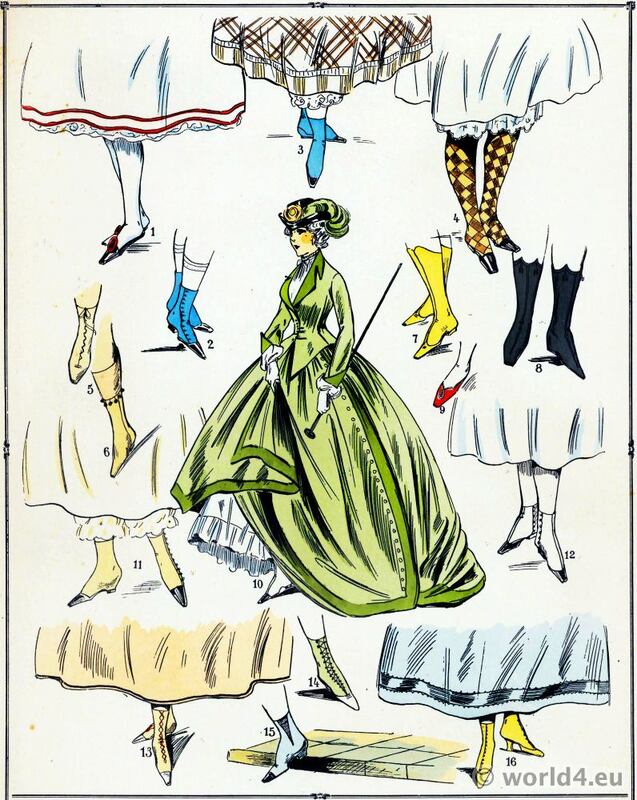 This entry was posted in 1852, 1870, 19th Century, France, French fashion history, Second Empire, Shoes, Victorian period and tagged Paul Louis de Giafferri, Second Empire Style, Second Rococo period, Victorian fashion on 4/26/14 by world4. Parures. Les modes du second empire 1852 a 1870. Adornments. The modes of the second empire. 1852 to 1870. 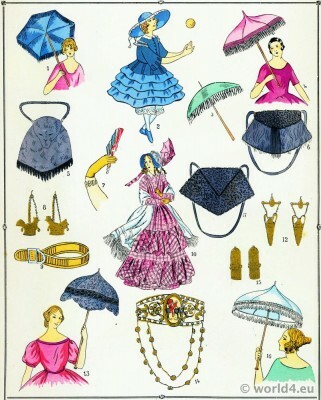 L’histoire du costume féminin français. Les modes du second empire 1852 a 1870. Parures – Planche 11. Robes. Les modes du second empire 1852 a 1870. Dresses. The modes of the second empire. 1852 to 1870. 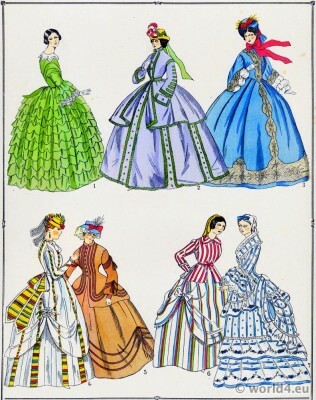 L’histoire du costume féminin français. Les modes du second empire 1852 a 1870. Robes – Planche 2. Élégantes. Les modes du second empire 1852 a 1870. Gowns. The modes of the second empire. 1852 to 1870. 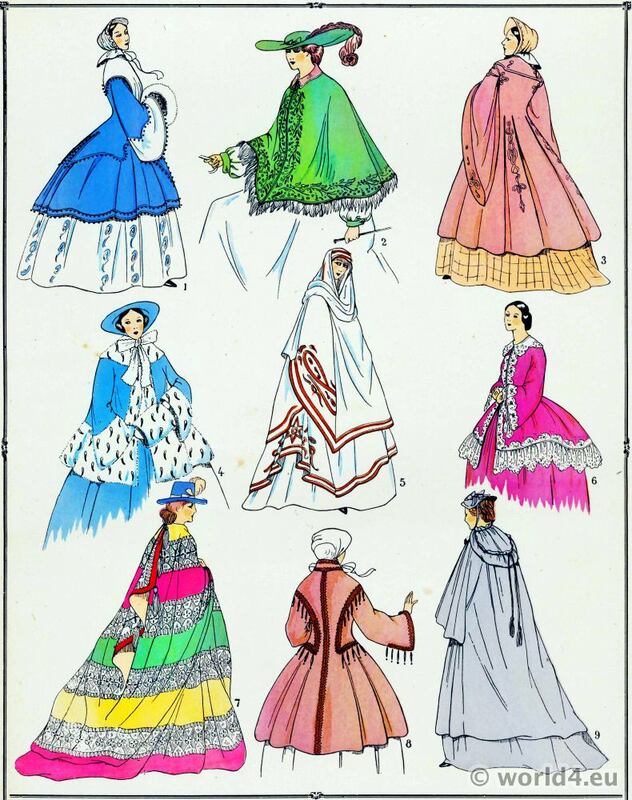 L’histoire du costume féminin français. Les modes du second empire 1852 a 1870. Élégantes – Planche 1. 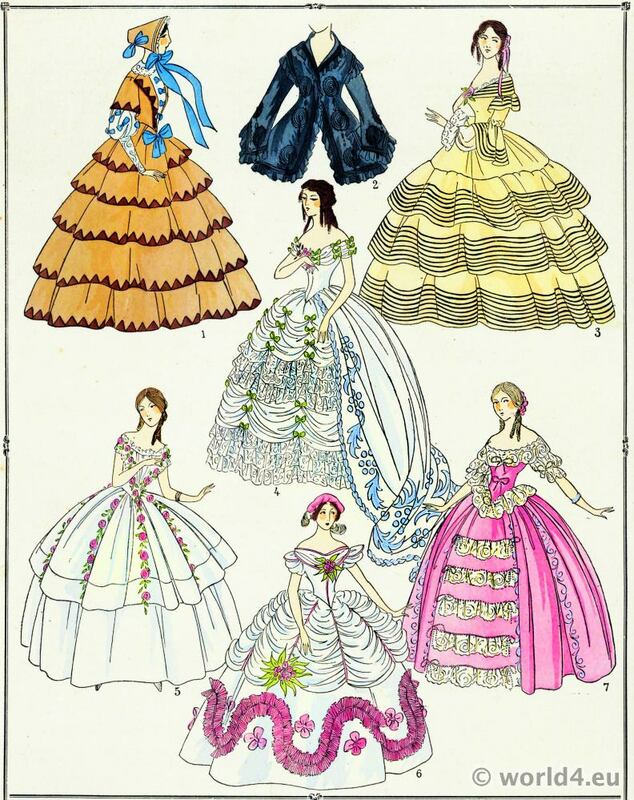 This entry was posted in 1852, 1870, 19th Century, France, Second Empire, Victorian period and tagged Crinoline costumes, Paul Louis de Giafferri, Second Empire Style, Victorian fashion on 4/26/14 by world4.